This is such an exciting time at our studio. All of our dancers have begun preparing for our studio recital. The recital is a time for celebrating and showing the parents what we have learned this year. All studios approach the recital differently. At GWDC we prefer to keep the recital simple and low-key. Our recital fee is a modest $80. For some of the youngest dancers, this may be their first experience on stage. We want it to be a fun and positive experience! The atmosphere will be casual! We will be performing at the Mary Louise Jackson Amphitheatre. This will be a fun, low-key family day. We encourage all of our families to bring picnics and enjoy being outside as they watch their children perform. Important: In case of rain, we will hold the recital on Saturday, June 13. The costumes are simple and inexpensive. Some classes will be asked to wear items they already have. Some classes will receive additional costume items and adornments which they will be able to keep once the recital is over. Costumes will be distributed in class the last two weeks in May. Each dancer will receive a personalized bag with costume items, accessories, and important information. Dancers should wear their costumes and headpieces on May 30th. Dancers should bring these bags on May 30th and June 6th with any other necessary belongings, snacks, and activities to keep them occupied while they wait. PLEASE LABEL EVERYTHING -- costumes, shoes, and tights. Each family will receive 3 free tickets to the recital. Additional tickets will be available for purchase at GWDC at $10 each. Tickets are limited as this is a small, intimate theatre setting. Flowers and Recital Program Dedications - Forms due May 23! You can pre-order flowers for your Dancer that will be fresh and available for pickup at the Amphitheater. All single flowers or bouquets will be individually wrapped with greenery. You can also add a card at no additional cost. 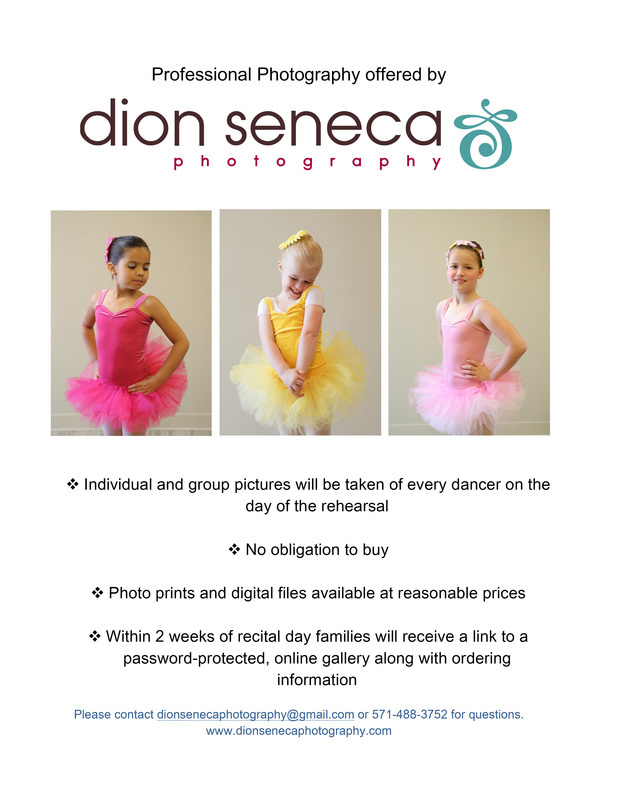 Surprise your dancer with a special program dedication for a great keepsake and record of his or her dance performance. Order Forms will be available starting Monday, May 11th. Order Forms are due with payment by Saturday, May 23rd. We will need 1 Volunteer Mom to help out during Rehearsal and the Performance for each class. Volunteers will help keep the dancers occupied during downtime, monitor restroom trips, help out with costumes, hair, and makeup as needed, facilitate dancers getting on/off stage. Please note: Volunteers will still be able to view their child dancing! We also need Volunteers to help out with Concessions, Flowers, and Ticket Taking. o Hair supplies such as hair net, hairspray, and extra bobby pins. All female dancers should have a ballet bun with a hairnet. Please use hairspray to slick back whispies. Please make sure hair pieces are firmly attached with bobby pins. We recommend light makeup for the female dancers to enhance features for the stage: blue eye shadow, pink lips, and a little bit of rouge for the girls. All Dancers must report to their assigned Amphitheater seats by 10.30am on Saturday, June 6th. They must be dressed in their ballet outfits with hair done. Please bring your bags with all of the additional items, peanut-free, non-staining snacks and water. Please be sure everything is labeled! Don't forget to SMILE and HAVE FUN! Due to copyright restrictions, no official video will be taken of the recital. Parents are encouraged to take their own videos of their dancers' performances. The ideal time would be at the rehearsal on May 31.